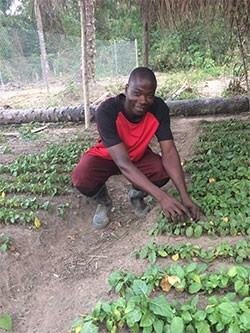 The World Vegetable Center promotes home gardening in sub-Saharan Africa and South Asia with healthy diet gardening kits designed to improve family nutrition. The kits are typically used in training programs to promote home gardening. Local food preferences and agronomic conditions are taken into account when seed is selected for the kits. The African kit contains 17 different kinds of high yielding and nutritious vegetables, with enough seed to plant a home garden and provide a healthy diet for a family of 8 for a year. In South Asia, several different kits containing seed of 7-26 vegetables have been used in Bangladesh and the Indian states of Punjab, Jharkhand, Odisha, and Assam. Most kits provide sufficient seed to plant a 6 x 6 meter home garden to supply nutritious leafy vegetables year round. The more complex garden designs can produce more than 250 kg of vegetables per year and provide more than adequate vitamin A and vitamin C requirements for a family of four as well as supplementary protein and iron. Seed for kits is produced by partners who assemble home garden seed packs for local needs. For more than 20 years the Center has researched and developed vegetable production seed kits for our farmer training programs. But these seed kits also serve an additional purpose: When natural disasters destroy food production systems, vegetables can help rebuild local food supplies and provide nutrition for survivors. Since 2000, the World Vegetable Center has distributed more than 65,000 disaster seed kits through humanitarian agencies to the victims of major disasters in Africa and Asia. The kits include seed of locally adapted varieties of nutrient-rich, fast-growing vegetables, and technical information in local languages on vegetable production, food preparation and preservation methods. Each kit provides enough seed for one household to grow vegetables on 100 square meters of land to provide a balanced supply of protein and micronutrients during the initial months after a disaster. Five different seed packs have been developed for East Asia, Southeast Asia and Pacific, South Asia, and sub-Saharan Africa. Seed handling and packaging: All seeds will be dried, threshed, processed and carefully packaged. Seed short-term storage: After packaging, the seeds will be stored at World Vegetable Center headquarters and our regional centers, ready for any urgent request. Extension leaflets: Instructions for cultivation and food preparation will be published in local languages and included in the kits. Seed quarantine: To be ready for disasters before they occur, the seed kits will be assembled and quarantine processing will be conducted ahead of time. Seed distribution: The vegetable seed kits will be distributed mainly to farmers in disaster-affected areas by cooperating with relief agencies.